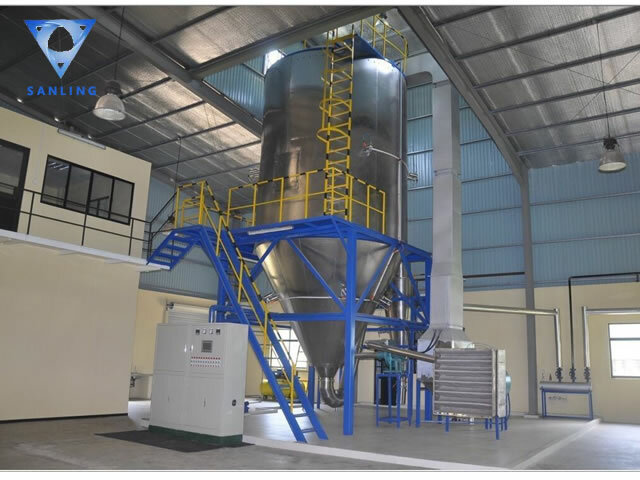 ZLPG traditional Chinese medicine extract spray dryer is a specialized for plant solution drying, drying product with good color, does not degenerate ,It improve the economy of the plant; it is fully enclosed form equipped with three grade purification devices, filtered dry air up to one hundred thousand or even higher grade. Cylinder and the top installed cold wall device, so that the wall temperature less than 80 ℃, the product will not appear coking deterioration phenomenon; drying tower equipped with air cleaning device, the collection rate up to 99% , also does not produce mixing and sticky wall phenomenon; equipped with CIP-line cleaning device, it can be applied to more varieties of production requirements; exhaust wet scrubber make dust without leakage, in line with environmental requirements; system using PLC touch screen, and the use of dehumidification of dry air sealed delivery of finished products to the packaging storage silo. Through the heater, hot air enter into the top of the drying tower hot air distributor via fan, through the hot air distributor, the hot air into the drying Chamber evenly, and spiral movement. The feed pump also sends the feed to a centrifugal sprayer at the top of the drying tower, where the liquid is sprayed into very small droplets of mist. So that the liquid material and hot air contact surface area greatly increased, the rapid evaporation of water in a very short period of time for dry goods. The dry product is separated from the wet air by the cyclone separator and sent to the small cyclone separator by the dry air from the bottom of the cyclone separator and collected in the collector. The exhaust gas is discharged by the blower. Hot air system, purge system, wind delivery system are equipped with primary effect, high efficient and other filters, the air is filtered before enter into the drying Chamber. Stainless steel is applied in air contact parts in line with GMP requirements. Intake air temperature achieves automatic control device.